Kestrel spends some time with baby Newt to give his parents a much-needed rest. The night was turning out to be relatively peaceful and cool, unusual for this time of year. Kestrel was happy for the respite from the relentlessly hot days, and the thought even crossed her mind that she might like to take a ride with her wolf-friend, an activity she hardly ever had need for. As she pulled aside the den-hide, though, the jarring sound of a crying baby startled her, disrupting the peaceful atmosphere of moments before. Poor little Newt, Kestrel thought to herself. The baby had been having crying episodes like this for the past few days on and off, needing constant attention and only sleeping a little at a time. Reaching out for her light cloak hanging nearby, she wrapped it around her shoulders and exited into the cool night air. The glider figured she would pay a visit to her uncle Strand and his family � perhaps there was something she could do to help out. As Kestrel neared the dwelling of her uncle and his lifemates, she could better make out the baby�s crying. He sounded more than just fussy � baby Newt was genuinely distressed and unhappy. **May I come in? ** she sent to the lifemates. **Of course, niece,** Strand sent back warmly, though Kestrel could sense the agitation in his thoughts. As she pulled aside the hide and entered, Kestrel could immediately see how worn out little Newt�s parents were. **Is he doing any better? He doesn�t have a fever, does he? ** Kestrel asked with her eyebrows knitted, continuing to send for Turtle�s benefit. She walked towards Turtle, who was currently holding the baby, rocking him soothingly. **No � from his sends, it seems like he has a stomachache. He just can�t relax enough to sleep very long,** Lacewing sent tiredly from the bedbowl. Kestrel attempted to draw the baby�s attention with smiles and cooing sounds, but Newt would have none of it. She crossed her arms over her chest � the night was a little cool, but perhaps...? **I could take him out gliding for a little bit? It may help to relax him,** she suggested, looking at each parent in turn. It was something that Kestrel had done for cubs many times in the past, either to soothe or entertain � practice, she hoped, for the cubs she might one day have. Even though Newt was still so tiny, Kestrel could see that his parents were seriously considering it, sending to one another � at this point, she figured, they would probably be open to trying anything. After a time, it was Turtle who responded. **All right, but just for a little while,** he sent, sounding every bit the nervous parent. The three of them had so far been much more protective of Newt than their other two sons � Kestrel surmised that between the tragedy of losing young Bramble that same year and the fact that Newt had been born a bit different than other cubs, with his out-of-Recognition conception and his delicate skin and eyes, his parents did not want to take any chances. She was grateful that they trusted her enough to keep the baby safe. Turtle laid the baby down in his swaddling fur, making sure to wrap him snugly for protection against the cool air. Even the swaddling, which sometimes worked to calm fussy babies, did not seem to do much to relax little Newt. With that, she moved towards the den entrance, pushed aside the hide, and flew off into the night. 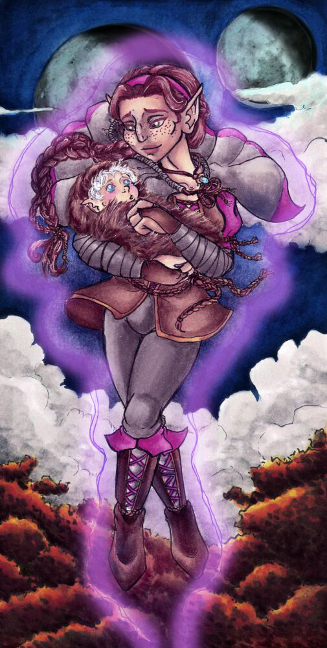 She started slow, so as not to startle the baby, heading into the woods and weaving through the trees. She knew exactly where she wanted to take him. Eventually, she picked up a bit of speed, heading up to the tops of the trees. By this point, the baby was still whimpering and hiccuping, but he also seemed interested in the new surroundings flying by him. So far, so good. Smiling, Kestrel finally cleared the trees, gliding up into the night sky. Gone were the familiar forest surroundings, and instead the two were encompassed only by the cool night air, with the forest far below and the vast black canvas above them. But the most marvelous thing of all was how close the two moons seemed to be, as if one could reach out and lay a hand on one of them. Little Newt seemed not to know what to make of all this, his head turning this way and that as he tried to take in all of the new scenery. Being as young as he was, Kestrel was pretty sure that his vision wasn�t developed enough to see everything clearly, but the difference between this and what he was used to was big enough to pique his curiosity. His gaze returned most often to the two shining moons, the biggest attractions in the sky. **Do you like what you see, little one? ** she sent to him with a smile, and his send in return was full of wonder and surprise. **I know the feeling,** was her response, and she continued to float with him above the trees until she could see his eyelids struggling to stay open. The combination of the distraction and the soothing motion of gliding seemed to be working to help him relax, in addition to the weightless feeling that the gliding powers contributed. **Try not to fight it,** she sent soothingly. **You need your rest. ** Eventually, the baby�s eyes did close, and he drifted off into sleep. There was no way of knowing how long his sleep would last for, but Kestrel was glad that at least she had given his parents a bit of much-needed rest, and she would take her time heading back to the Dentrees. She hugged the little boy close to her as she began her descent, smiling as she gazed at his tiny face that was now relaxed in sleep. He was a strong baby, that was certain, and it was an amazing thing to see. No one in the tribe had really been sure what to make of his apparent differences at birth, and his parents often worried that life would be harder for him because of it. Perhaps that was so, but looking at him now, Kestrel felt sure that the little boy had what it took to overcome any difficulties that might come his way.